Dwayne Haskins was going to make an impression at his Denver Broncos interview, one way or another. When Haskins, the Ohio State quarterback who has a chance to be the second quarterback selected in this month’s draft, met with Broncos general manager John Elway, he made a bold choice in his wardrobe. He wore an Elway jersey to his interview with Elway, Denver’s general manager, according to SI.com’s Kayln Kahler. It’s not like Haskins can pull off that trick very often. He can’t wear a Brian Gutekunst jersey to meet with the Packers GM or a Dave Gettleman jersey for a pre-draft meeting with the Giants. But Kahler explained that Haskins has been a fan of the history of the NFL and particularly Elway since he was young. He wore No. 7 at Ohio State in part because of his respect for Elway, SI.com reported. Give Haskins credit for digging into the history. He was born in May of 1997, less than two years before Elway’s final game in his legendary career. Snide remarks aside, the Broncos aren’t going to make a franchise-changing decision with the 10th overall pick because Haskins wore a throwback No. 7 jersey (they wouldn’t ... right?). But the Broncos might be in the sweet spot to take Haskins, if they like him. Haskins threw for 50 touchdowns last season and has some obvious skills. 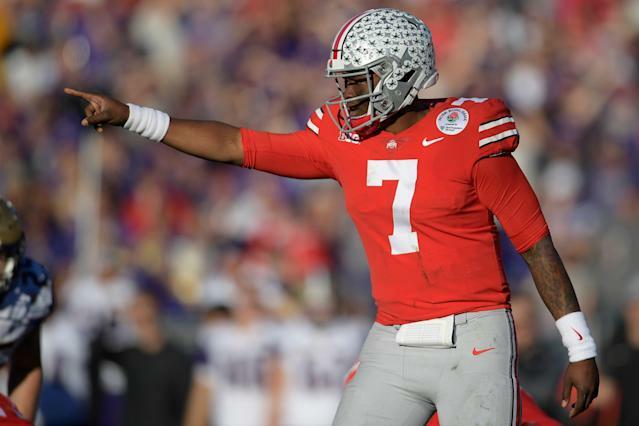 But the buzz about him leading up to the draft has been a little cool, and Haskins fell surprisingly far in the latest mock draft by Eric Edholm of Yahoo Sports. The Broncos will have to consider drafting a young quarterback of the future. Edholm’s mock draft had them taking Missouri’s Drew Lock at No. 10, but it wouldn’t be too crazy if they chose Haskins instead. And at very least, we can assume Haskins’ pre-draft interview will be memorable to Elway.